Konichiwa, everyone! It’s Wednesday, and you know what means! Yes, it’s time to look at some more fascinating yokai. Now, let’s go on a journey to the “Land of the Rising Sun”! Kaichigo is a mischievous creature of Japanese mythology.It is the spirit of a shell box. The spirit resembles a small doll-like boy covered in a kimono. When no one is around, the Kaichigo will play around with the shells, and swap their positions. Dotsu-Sama is a malevolent creature of Japanese folklore. It resembles a small white and gold snake. It is said that the owner of the snake will become incredibly wealthy, and some use it to kill. If betrayed, Dotsu-Sama will turn on its owner, and attack him. Hello fellow comic book fans! It’s Tuesday, and you know what that means! It’s time to crack open the comic vault, and look at the weirdest characters ever created. Now, grab your favorite issue, and let’s begin! Sixpack Real Name: Sidney Speck First Appearance: Hitman #9 December 1996 Created by: DC Status: Hero and Delusional Drunk Powers: Expert in unarmed combat and weapons handling; incredibly high alcohol tolerance. Sixpack is one of DC’s strangest superheroes. He once was the leader of Section Eight, a superhero team with equally strange powers. His history is hard to figure out, and due to the heavy consumption of alcohol he can’t remember anything from his past. Armed with his trusty broken bottle, Sixpack is always ready to start a fight. That is, if Cirrhosis doesn’t catch up with him first! *By the way, I strongly recommend reading Section Eight, it’s one hell of a journey! Madcap Real Name:N/A First Appearance: Captain America #307 July 1985 Creator: Marvel Status: Villain and prankster Powers: Incredible self-healing ability, able to survive almost any injury; causes others to lose inhibitions with embarrassing and sometimes lethal consequences. Madcap was originally a normal man, and devoted Christian, until a horrible bus accident rendered him insane. The bus collided with a truck carrying experimental nerve gas, killing everyone on board but Madcap. He developed the ability to heal from any injury, and used this to go on a crime spree. He has butted heads with many superheroes including Wolverine and Nomad. I’m back from my Thanksgiving break! I hope that you all had a pleasant time with your family and friends. Now that the break is over, I’m ready to start posting again. Hello fellow art lovers! It’s Monday, and my Art Gallery is open once again! I hope you guys are ready for some truly magnificent masterpieces. Now, have fun exploring the gallery! This is a very fascinating work by “Chilean Surrealist”, Roberto Matta. In this piece, Matta uses various styles of blending to bring out the bright colors. The work has a hypnotic aura surrounding it, and this causes the viewer to ponder the meaning of the work. The “Earth” that the piece mentions is very small, and has a strange human face. It also has yellow beams surrounding it. This could be the Artist’s depiction of a strange alien world that defies the laws of physics. The way that I see it, the more crazy and bizarre the piece is, the more of an impact it leaves on the viewer. I’d love to hear your thoughts on it in the comments’ section below. This is another epic piece by “Computer Guru”, Larry Carlson. Where to even start with this piece! Well, the most prominent object in the painting is this weird spherical mass of blended faces. A Jewish Star appears in the middle of the sphere, and a lion’s head emerges out of the star’s center. For some unexplained reason, we also see a purple Jesus sitting on the top of the mass. As we descend the painting, we are met with strange alien creatures and a rainbow background. I also can’t forget to mention the tiny devil situation to the right of the piece. I’d love to hear your thoughts on the work in the comments’ section below. Hello fellow Marine Biologists! It’s Tuesday, and you know what that means! Yes, it’s time to look at some more amazing sea creatures. Now, let’s begin! The Spanish Dancer is an incredibly beautiful creature of the sea. It is the largest type of sea slug, and comes in various colors. The creature gets its name from the undulating movements it makes in the water. Their diet consists mainly of sponges, and they are all hermaphrodites. When in danger, the Spanish Dancer will try to swim away, exposing its brightly colored body. The Peacock Mantis Shrimp is a very bizarre creature with immense strength. This type of shrimp is named for its brightly colored body and long legs. When prey wanders too close, the Mantis Shrimp will strike with its legs at speeds up to 75 mph! This is combined with force 100 times the shrimp’s weight! Because of this feat, the Mantis Shrimp can easily take on prey larger than itself. That’s Insane! Hello fellow art lovers! It’s Monday, and my Gallery is open once again! I hope you guys are ready for some incredible works. Now, let’s dive in to the amazing world of art! This is an incredibly intense work by French Surrealist, Andre Masson. It is a brilliant explosion of colors that appear to jump out of the painting. The various streaks of paint remind me of a Jackson Pollock piece, and it really gets the viewers attention. The complex patterns of red might resemble blood in relation to the painting’s name. Upon closer inspection, you can vaguely see faces amongst the crimson paint. They look almost demonic, and this gives off ominous vibes. The painting is extremely powerful, and I felt like it was pulling me inside the frame. It is a very unique and mesmerizing piece that I hope you all will enjoy. Tell me your thoughts in the comments’ section below. 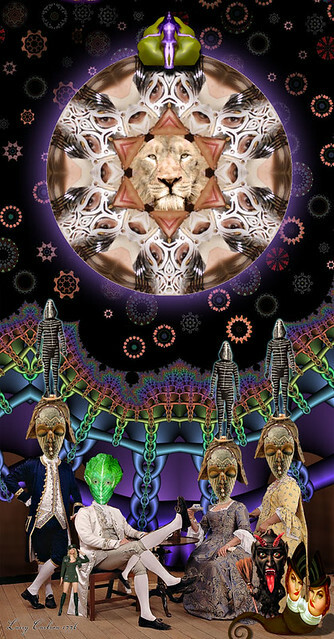 Time for our weekly dose of Larry Carlson! I can’t give this man enough praise, and I absolutely love reviewing one of his masterpieces every week. This work is especially awesome, and I can’t wait to share it with you. The painting appears to take place in a completely different dimension, where trippyness is of the norm. We have a “very realistic” looking female figure that seems to be pressing a button. Notice the quotations, this is where things get Carlsonized! The figure’s eye is extremely wide, and appears to be upside down. The machine she’s pressing has various symbols on it. These symbols are used to cards to practice telepathy. A rainbow aura is emanating from her hand, and a strange ribbon-like object seems to be coming out of the machine. I also can’t forget to mention the abundance of purple faces that take over this work. There’s even a face in the woman’s hair! Large beams of orange light are also descending from the top of the painting. What the work means I believe is up to personal opinion. I’d love to hear your thoughts on this incredible piece in the comments’ section below. Hello fellow mixologists! It’s Thursday, and my Pub is open once again! I hope you guys are ready for some cool drinks. Now, let me fix you up something special! Directions: Layer the ingredients in a shot glass using a spoon, with the Hpnotiq on the bottom, dark rum in the middle, and 151 rum on the top. Directions: Pour the tequila and pineapple juice into a highball glass almost filled with ice cubes, and stir well. Drop the blue curacao into the center of the drink, and serve. Konbanwa, everyone! It’s Wednesday, and you know what that means! Yes, it’s time for us to look at some more fascinating creatures. Now, let’s got on a journey to the “Land of the Rising Sun”! Gagoze is a very dangerous creature of Japanese mythology. It’s depicted as a hideous demon dressed in the robes of a monk. He’s known to have superhuman strength, and has a diet consisting of children. Raiju is a fearsome creature of Japanese folklore. It’s a gigantic beast with a body of lightning. It can take on many forms, which include; a cat, fox, weasel, or wolf. While relatively calm, this yokai becomes enraged during thunderstorms. Trees that are struck by lightning are said to be scratched by Raiju’s claws.